View from the road. I wish I could give you a smell from the road. Unfortunately this restaurant is no longer open. The old cliché, “a diamond in the rough”, is a bit overused these days, but I can’t think of a better way to describe “Hillsdale Bank Bar-B-Q” in Hillsdale, KS. Nestled into the town’s old bank building, is one of the best kept secrets in the entire Kansas City area. 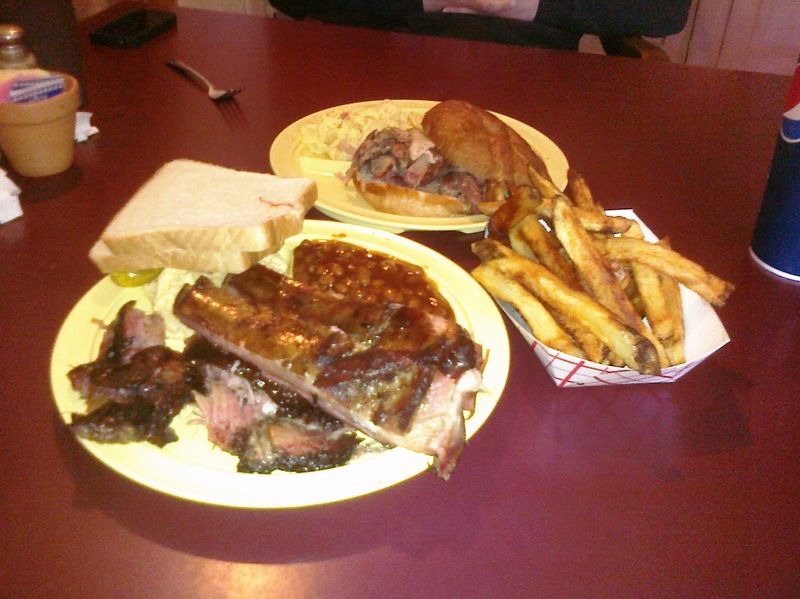 The 20 minute drive south on Highway 169 from Olathe is definitely worth it for this barbeque! While I was there, I tried a pork rib platter, with pork burnt ends as my second meat choice in the meal. The platter came with two sides of my choice plus an order of delicious hand-cut fries, and the obligatory bread slices and pickle too. My wife had a pulled pork sandwich with potato salad. The ribs were cooked about as well as they can get. They were meaty and tender and were served with just a hint of sauce on them to complement the rub. I sampled some of the pork from my wife’s sandwich and it passed all tests! It was tender, had a nice smoky flavor, and maintained moistness without compromising leanness. The pork burnt ends were the star of the show, as far as I was concerned. They were fork tender and had all kinds of the “bark” on them that really delivers the deep smoke and rub flavor that a barbeque judge looks for. None of the three of the meats required sauce to be tasty as far as I was concerned, but the Hillsdale Bank BBQ sauce, simply known as “The Sauce” still had a place at the table. It is a superb sauce that makes a great compliment to the outstanding quality and taste of the meat. Take a look inside the bank with Wired BBQ and I am sure you will enjoy the indoor décor and exposed brick walls in the old building. The bank is both entertaining and interesting, really adding to the dining experience. When the meal was all said and done, it was certainly safe to say that the owners of Hillsdale Bank Bar-B-Q, Greg and Donna Beverlin, certainly know how to cook a pig! One could even say, you can bank on it! The BBQ Shack in Paola, KS. At first glance inside “The BBQ Shack” in Paola, KS, it’s not hard to tell that owner Rick Schoenberger has a passion for “The Andy Griffith show”. At first smell however, you can tell that all the Mayberry décor is secondary to Rick’s enthusiasm for creating first class barbecue! 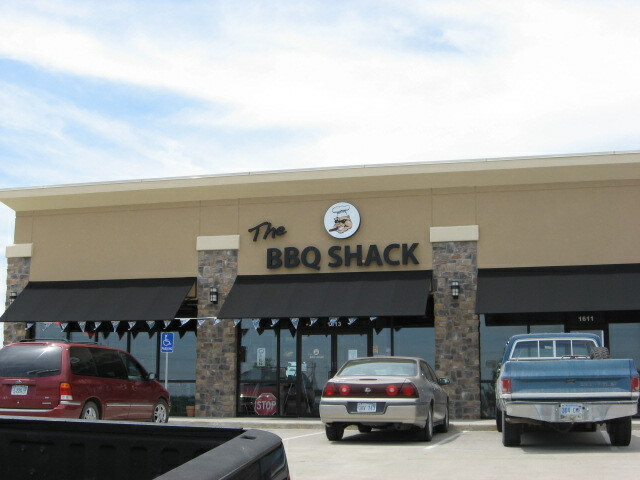 The BBQ Shack is the culmination of a dream that Rick, a former electronic industry worker, once had in the mid 1990’s. The dream started as a catering business in 1997 and then grew through several locations until it ended up at its present site just off of U.S. Highway 169 in Paola. Over time, The BBQ Shack has become a staple in the community, and as if achieving local fame was not enough, it can even boast that in 2007 it was featured on Food Network’s “Diners, Drive-ins, and Dives” TV show. On my latest visit there I had the “Foley’s Rib Plate”. The main attraction of the meal was a set of 3 huge pork ribs, with my second choice of meat on the plate being pork sausage. The customary 2 sides I chose were fries and beans. The meat simply fell off the bones on the ribs, yet they were not overcooked one bit. The sausage, was melt-in-your-mouth good, and got even better when I put a hint of the hot bbq sauce on it. If you’re lucky enough to make it to The BBQ Shack, consider trying the “Atomic Buffalo Turds” (cored jalepeno peppers stuffed with cream cheese and marinated water chestnuts) or the “Kerosene Cucumbers (extremely hot pickles) to go with your main dish! Van reads: This soccer-mom van is just a disguise. Its really clever, like a curly mustache and big glasses. We’ve got awesome food in here. We just don’t want to get mobbed. As my wife and I were on our way to a mid –August wedding at one of the 8 wonders of Kansas, the St. Fidelis Church, we decided to make a stop in Hays, Kansas for lunch. We picked a hip spot in downtown Hays called Gella’s Diner and LB Brewing Company. You would expect to find a modern, trendy joint like this in Kansas City or Denver however; it is a nice surprise to have such a place out on the Kansas high plains. In fact, I’m pretty sure this is the only brewery between Manhattan, Kansas and the Denver, Colorado area. There were plenty youthful and outgoing staff members on hand to serve the two dozen or so lunch time diners. To satisfy my pork craving, I ordered the pork pibil tacos. The tangy and juicy pork tacos were served with two sauces, both a green and red chili sauce. I preferred the red, which hinted of a chipotle sauce. The juicy pork made the hard-shell corn tacos a bit soggy, and with that in mind, I would have preferred them to have been served up in soft flour tortillas. Or better yet, put that flavorful pork on a fresh bun and serve it up as a Memphis style pulled pork sandwich! Either way, pork tacos are certainly a rarity on most menus. 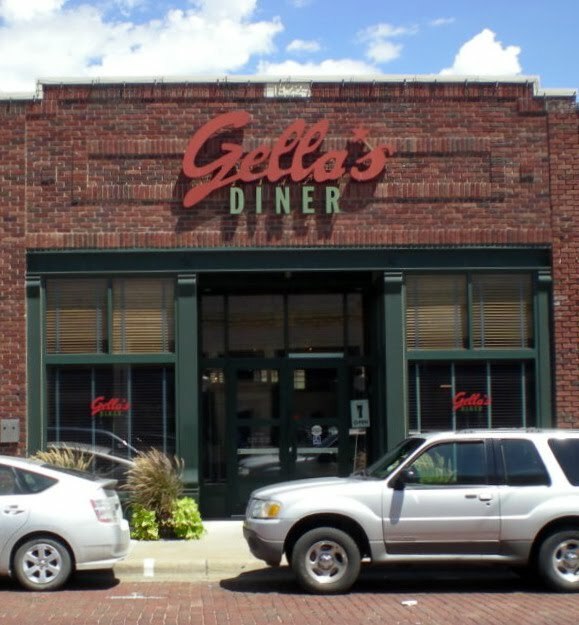 I would encourage you to check out Gella’s Diner, located in the Historic Chestnut Street District for a taste, and atmosphere, of something different. – Until next time…swine and dine!